Big Box Retail: What Can Be Done About Them? Can Big Box be effectively stopped? 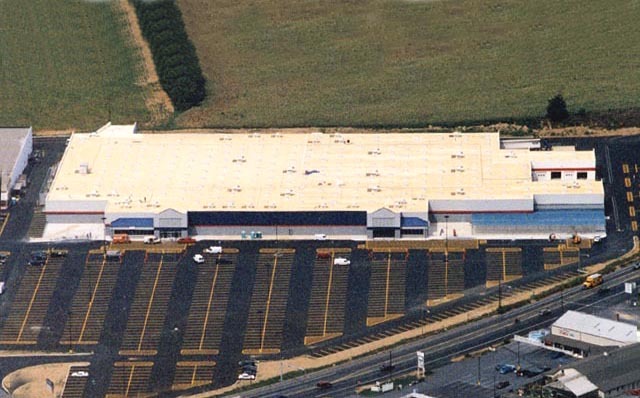 As I have noted elsewhere, large-format retailers such as Wal-Mart, Home Depot, and Costco (colloquially known as “Big Box Retail”) create enormous retail, transportation, sprawl, and economic problems. It is also well-known that they strongly contribute to an “Anywhere USA” ambience that undercuts the unique character of communities. What can be done to stop Big Box Retail? To stop Big Box encroachment into the community, the community must, above all else, cut off the lifeline that makes Big Box retailing possible. The key to discouraging Big Box is, like so many other community problems, transportation-related. Effectively discouraging Big Box means not modifying nearby roads to add road capacity (for example, by adding turn lanes at intersections or adding travel lanes). If nearby intersections or roads (or interstates) are already “overweight,” an effective strategy is to put them on a diet by removing turn lanes and travel lanes. Admittedly, this is a very long-term strategy. 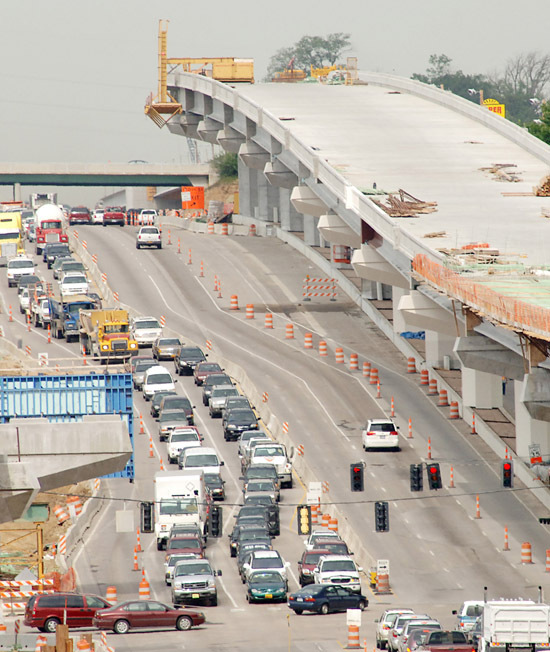 But the terrible reality is that this nation has spent several decades spending trillions of public dollars to build huge interstate highways and huge local arterial roads. The predictable result of that enormous public subsidy is that it gave birth to a nation-wide epidemic of Big Box retailers. Such retailers can only exist if they are able to gain access to an enormous, regional consumer-shed of customers (customers from multiple counties). The big roads and interstates have created that opportunity, and Big Box executives are taking advantage of this prospect by building Big Box throughout the nation. In essence, we are now paying for the sins of our forefathers and foremothers, who chose to squander ungodly sums of public dollars to widen roads, and therefore indirectly and heavily subsidizing Big Box retailing. It is naive to think we can stop Big Box until we start reversing the blunder of building these gigantic roads and interstates. With modest roads, Big Box is impossible. With large roads, Big Box is inevitable. Many communities employ Big Box discouragement strategies that are ineffective. Let us review some of these. 1. Environmental regulations. Such regulations tend to be very weak; overly subjective; difficult to measure, monitor or enforce; and very easy to evade—particularly by a well-heeled developer. 2. Generous landscaping and open space requirements. These are minor “window dressing” items that are nearly irrelevant when it comes to the problems that Big Box brings to a community. And again, the substantial financial wealth of the Big Box developer makes such expenditures painless. 3. Restrictive building design requirements. Again, these are minor window dressing items that are inconsequential in the overall picture. The problem with Big Box is not that the Box is ugly. Granted, the Big Box building is an awful, pathetic form of architecture, but on a list of 100 evils that a Big Box delivers to a community, ugliness is near the bottom. And wealthy Big Box developers will often not even blink an eye to pay the pocket change needed to make aesthetic improvements if push comes to shove. This is not to say that a community which finds it must accept a Big Box should be silent on the question of how the Big Box building is designed. 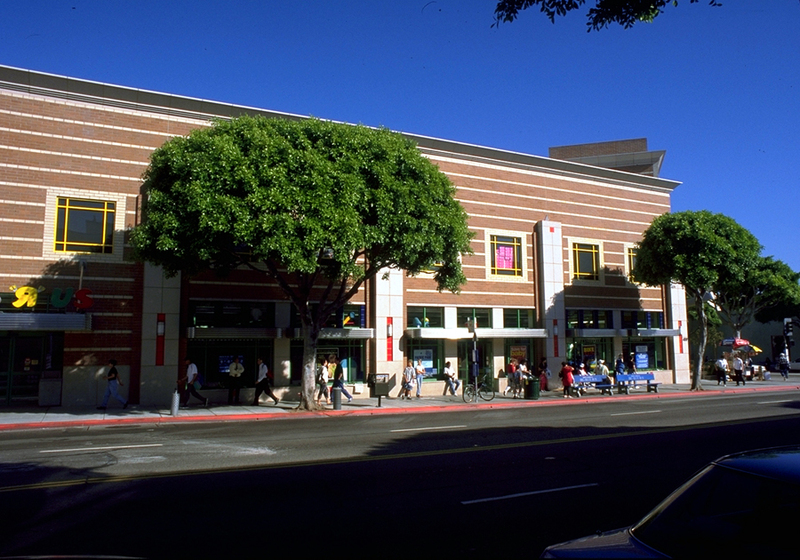 If a Big Box retailer must be allowed, it is important that the community (if it has any semblance of self-respect and civic pride) insist that the Big Box be designed to be compatible with the character of the community. Note, however, that the elected officials need to have a great deal of political backbone (and design wisdom) for this building design strategy to work. Design regulations for Big Box require that you can trust your elected folks not to cave in to “moral high ground” arguments (such as “this Wal-Mart will provide jobs for poor people”). If you cannot trust your elected officials to stand up to such moralizing, it may be best to take the route of prohibiting Big Box from your community (by setting a maximum retail building size of, say, 75,000 square feet) instead of requiring that they abide by design requirements. A more feasible approach than community-wide prohibition is to simply prohibit them in parts of your community that are intended to remain (or become) compact, walkable and mixed use—such as your town center. Areas where they could be allowed are those places intended to provide for the auto-oriented, suburban lifestyle. The downside to this approach, of course, is that the harmful aspects of the Big Box are far-reaching, and its tentacles can easily damage the smaller, locally-owned, more walkable portions of the community. 4. Appeal to the harm the Big Box will bring to “poor people.” In public meetings, the Big Box will always have the moral high ground when it comes to “poor people.” After all, don’t they provide “Low, Low Prices” that “help” poor people? Arguments about how the Big Box provides “excessively low-wage jobs with no health care” or how Big Box “promote sweat shops in Mexico” are too abstract and complex for the sound-bite conditions of a public meeting. 5. Request road “improvements” to avert congestion. 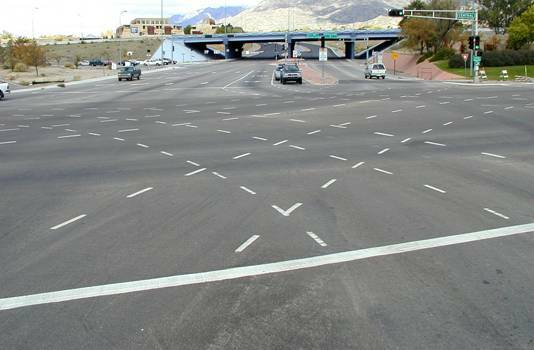 As implied above, requiring the Big Box to provide huge, multi-turn lane intersections or huge, multi-lane roads to serve them and avoid “gridlock congestion” is a common mistake that plays into the hands of the Big Box. First, it is pocket change for Big Box to come up with the dollars to increase the size of nearby roads/intersections. Second, it is often the local or state government that ends up (further) subsidizing the Big Box by using public tax dollars to increase such road capacity (justified because Big Box “provides jobs/tax revenue”). Third, such big capacity roads enable Big Box. They must have such roads to be successful. It is therefore not a “punishment” to request they provide such roads. Indeed, I suspect that the Big Box often deliberately lets the perception arise that “nearby roads need to be enlarged to avoid congestion,” when all along, the Big Box was being coy and hoping that this “concession” would be “demanded” of them. The Big Box cannot exist without the Big Roads and Big Intersections. For the local government and its citizens to insist on such roads is precisely what the Big Box is hoping will be demanded. Fourth, in cities, traffic congestion is our friend. 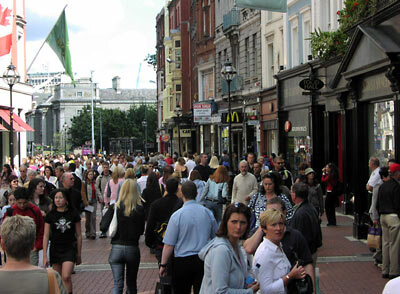 It promotes many things a healthy community desires: infill development, less car travel, higher residential densities, more mixed use development, lower regional air pollution and fuel consumption, multi-story buildings, less asphalt parking, healthier transit, healthier small (and locally-owned) business, and less suburban sprawl. 1. In almost all cases, there are polarizing, wide-ranging viewpoints on the part of elected officials and citizens of a community about what is to be done about Big Box. Some want to prohibit them, others want to go after them with aggressive design requirements. Still others don’t want to regulate them at all – fearing that to do so might chase away “desirable” retail development. Given these conditions, perhaps the most effective, politically viable strategy is to establish context (or location)-sensitive regulations. 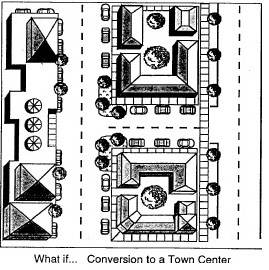 For example, the community may wish to prohibit them (with a square footage size cap) in its walkable, compact areas (such as in its town center). In suburbs, the community may want to allow Big Box, but establish design requirements for them. Near large highways, the community can perhaps acknowledge that such places are so car-oriented already (and so desirable to the Big Box) that there should be either very light regulation or no regulation at all for the Big Box. Using this context-sensitive approach can satisfy all viewpoints in a community. 2. At all costs, the Big Box must not be enabled by enlarging the road capacity near it (do not add additional turn lanes at intersections near it and do not add travel lanes on roads near it). If any road modifications are made, they should be to reduce such capacity. 3. 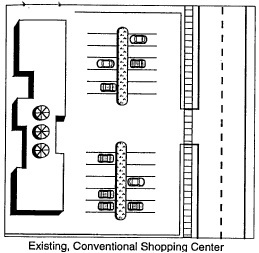 Outside of outlying suburban and highway areas, the Big Box must not be enabled by allowing it to install an enormous asphalt parking lagoon to attract tens of thousands of car-dependent shoppers. In or near the town center, the parking must be kept modest in size (no more than 1 space per 500 feet of floor area) and must not be allowed between the front of the store and the roads that serve it. Instead, the front of the building must be pulled up to the streetside sidewalk, as is done traditionally in walkable town centers. 4. The Big Box must not be allowed to select a site that is environmentally significant. 5. It may be important to insist that the Big Box be required to be “mixed use” – particularly when it is in a core area of the community. That is, high- density residences should be incorporated on site and adjacent to the site. 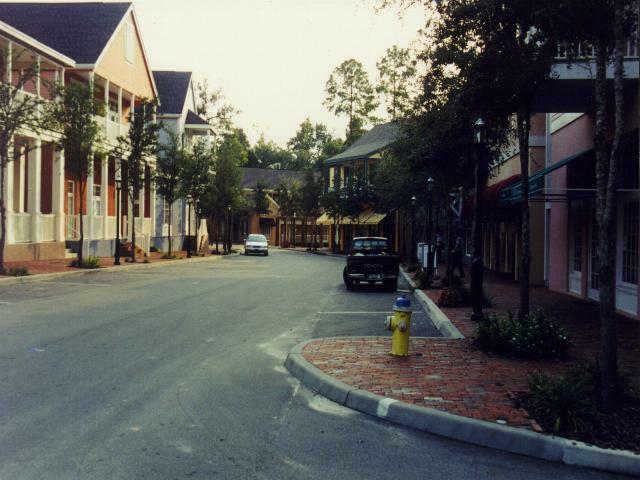 In or near a town center, the site shall be developed to contain a gridded street network with narrow streets, on-street parking, multi-story buildings, street connections to adjacent properties, and compact building arrangement so that it mimics a walkable town center (an open-air “lifestyle” center shopping mall is becoming quite popular throughout the US these days). Such design also ensures that the Big Box site can be adaptively re-used as somethin g else (hopefully more walkable and sustainable) once the inevitable day comes when the Big Box is abandoned. 6. If #5 above is not achieved, the Big Box must be required to sign a legally-binding agreement that it will be financially responsible for demolishing the structures it builds on the site and restoring the site to its original condition after the inevitable day in the not-too-distant future when it abandons the site (usually to build something even bigger somewhere else). In any event, the community needs to make a decision with a prospective Big Box: Will we allow the Box to treat us like a doormat and degrade what is unique, healthy and lovable about our community? Or will we insist that the Big Box only come to our community on OUR terms? Will Bambi Save the City? We are a confused people. After decades of a downwardly spiraling in-town quality of life, many have fled from cities to the “serene, sterile and safe” suburbs. Across America, we see our town centers destroyed and abandoned. Asphalt and concrete everywhere! How did our cities fall from grace? For all too many, a quick glance at our abandoned, harsh, moonscaped cities provides an obvious — and wrong — answer: Add grass! Trees! Shrubs! Open space! The universal cure-all medicine for saving our dying city patients is a nature band-aid to seek to cover the wound of bad urban design. The nature band-aid has become the remedy we too often reach for to solve nearly all of our community development problems. But prescribing this medication illustrates how befuddled we have become about why our cities are struggling to survive. Cities struggling to retain and attract jobs, residents, offices, and shops. The fundamental cause of the downfall of our cities as places we care about and take pride in is the radical change that has taken place with regard to scale. We have single-mindedly sought to design our cities so that they are scaled for cars, and in the process have lost sight of the fact that such a scale tends to wildly exceed the human scale — a modest dimensioning that makes people feel comfortable. Buildings are close together and close to the sidewalk, thereby forming cozy “outdoor rooms.” Signs and lights are small in size and short in stature. Streets are designed for slow, human-scaled speeds, are narrow and therefore easy to walk across, with tight corners. Surface parking is either on the street, or modest and hidden away when off-street. But what do we find instead of this sensible, lovable, charming vision? Too much of our cities have been handed over to the voracious size needs of our cars. We are now overwhelmed by too much space in our town centers, and nearly all of it is in the form of roads, building setbacks and parking lots. So our dilemma today is this. Nearly all of us have come to believe that more “greenery” will improve the quality of our cities, yet in our rush to provide more “Bambi habitat” in our cities, we fail to see that adding nature to a walkable town center often moves us in the direction of car scale instea d of human scale. Buildings are set back too far from the street and each other (to fit in some “nature”). Sidewalks are narrowed or not installed. Grass is installed where there should be hardscape. When one looks at many European cities, which millions of people flock to each year to enjoy, is the attraction based on how “green” those cities are? Certainly not. What draws us is the modest, human-scaled design of those cities. The modest streets. The modest building setbacks. The modest distance between homes and shops. The modest and hidden parking areas. The modest signs and lights. In our relentless efforts to scale our cities for cars, we have created excessive sizes and distances in our cities. Sizes and distances that move our towns and neighborhoods away from what we love so much about the European cities — the fabulous Rome. The picturesque Venice. The stupendous Florence. The magnificent Paris. Instead, the gargantuan sizes and placelessness we create in American cities repel humans. And increase the ability (and likelihood) for people to live in sprawling locations outside the city (because there is no love any more for our car-happy cities, and because there is now enough space for one to easily and affordably escape the city, and travel to the city by car). Surely, those who urge more nature band-aids in the city are defenders of sidewalks, right? After all, it is common knowledge that pedestrian travel is a shining example of “trodding lightly on the earth.” But when we look at our town center design struggles, where space is at a premium, we generally find folks lobbying for “grass strips” between sidewalks and streets. Or large street trees in tight locations. Or grassy medians in the middle of streets. In addition, are there any nature lovers who will find it acceptable to sacrifice a tree in order to install a sidewalk — even in a town center location? This despite the fact that in town centers, the pedestrian is the design imperative, not trees. Those who are auto-dependent and live in sprawl certainly support such design. After all, grass and trees look pleasant to a motorist driving down the street — a motorist who never has a need to walk on sidewalks or cross landscaped medians. But the problem is this: In a space-poor town center where the extremely powerful car lobby demands massive amounts of space for car travel and parking, there must be a loser. And the loser will almost never be the car and its needs. No, the loser in almost every case is the forgotten, powerless pedestrian (and, ultimately, the quality of life in our town center). So how do we find space for enormous trees, landscaped medians and grass strips in a town center that strains to find room for space-hogging cars? We take from those with the least political power. We take from the pedestrian. Sidewalks are narrowed for the grass strip, and infringed upon by trees. It is both sickening and telling that on a large percentage of town center sidewalks, the degraded, disrespected pedestrian must walk single-file to squeeze through. Is that any way to be treated — particularly when you are walking with a friend or lover? The great irony, of course, is that there is nearly a consensus amongst designers that the pedestrian is crucial for creating a healthy town center. The second irony is that in the rare city fortunate enough to be the home to a great many pedestrians, these grass strips (which started out largely to improve “aesthetics”) soon become worn down and become dusty (or muddy) eyesores due to continuous trampling by pedestrians. The solution for a quality pedestrian realm town center is clear. If space cannot be taken from the street, brick or concrete hardscaping should extend from the sidewalk to the curb (if not continuously, then at least at regular intervals), landscaped street medians need to be crossed by hardscaped crosswalks every 10 feet or so, more modest shade trees should be selected for use, and street trees should not be embedded in the sidewalk unless sufficient width, at a minimum, is provided for two pedestrians to walk side-by-side. For many, of course, this represents unacceptable design. It takes away from the “greening” of the town center. And the motorist loses the pleasant view. NIMBYs disguised as environmentalists are often prone to saving every blade of grass and every spindly tree on a vacant town center lot — even if the lot is a weedy, degraded place too unpleasant to even support a squirrel or pigeon. Yet in America, there is little that is more crucial than finding ways to promote more infill development in the underused portions of our cities. More infill reduces per capita driving, makes neighborhoods more walkable, increases the viability of small, neighborhood-based shops, makes in-town neighborhoods more safe, sociable and vibrant, and increases property tax revenues that can be funneled into community improvements. Each of these things reduces the pressure for suburban sprawl. Higher densities are essential in creating a safe, pleasant, vibrant, and convenient place for walking. Unfortunately, in land-rich America, most communities have very low land values in their urban and suburban areas. And the enormous pampering of cars in our culture means that there is a distorted, heavy demand for a low-density lifestyle. The result is that a great many residential developers in small cities and suburbs seek to build at the lowest possible densities — often much lower than what is allowed by the community. A great many will demand lower urban densities. It is nearly a dogma that higher densities will be harmful to “nature”— even if “nature” is found in the middle of a city. Lowering the density of a project is an extremely common tool used to protect “Bambi Habitat” in a city. But as Patrick Condon once said, “density and environmental protection are not incompatible. If they are, we are in very deep trouble.” If we consider them to be enemies of each other, the resulting lower densities will deliver us larger asphalt parking lots, larger roads, more driving, and more suburban sprawl — all of which end up replacing or endangering our important natural areas. Restricting the supply (and location) of parking — i.e., controlling the size and obtrusiveness of it — is one of the most important ways in which a community can control over-dependence on car travel and, therefore, the powerful tendency to create suburban sprawl and a place where it is unsafe, unpleasant or inconvenient to be a pedestrian. For these reasons, communities are increasingly restricting the amount (and location) of parking allowed for a development project. Sprawl advocates obviously oppose any restrictions on parking. 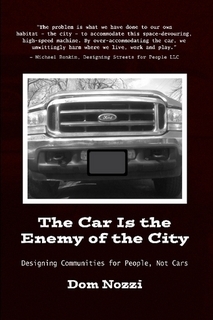 The huge car subsidies our society provides create a large market of homeowners and non-residential property owners who know that designing for easier car use is desirable. Big parking lots are therefore quite frequently required by financial institutions who are being asked to lend money for a project. The sea of parking is seen as a way to ensure financial success. Motorists are on welfare. And we have spent several decades building communities where it is extremely difficult to travel anywhere without a car. The inevitable result is that nearly everyone is has a vested interest in making cars happy. As a consequence, we sometimes find the curious scene in which liberals, “greens,” other assorted “nature lovers” or arm-chair environmentalists will stand shoulder-to-shoulder with the road and sprawl lobby to urge the construction of as many free parking spaces as can be built for a proposed project — particularly for shopping areas (where a number of folks will someday want to drive to in order to buy, say, recycled computer paper in order to “save” the environment). As motorists, we are always feeling squeezed in by congested streets and filled parking lots. Is it not obvious that town centers need more “breathing room” — more open space to relieve the “crowding” of town center? We have gone overboard on “open space,” but it is space for cars, not people. In other words, what we find is that most of this “open space” is devoted to parking lots and roads and large building setbacks (for recently constructed buildings). Certainly, our experience as motorists tell us that there is too little open space. That town centers are crowded. But again, such perceptions come from the adoption of the values of the car. Cars need an ENORMOUS amount of space and quickly “feel” crowded when only a few other cars are around. To feel happy, cars need vast seas of asphalt. The excessive amounts of car open space we establish in our town centers create an unwalkable design lacking in human scale. Distances between buildings are overwhelming on foot, and the spaces between buildings fail to create a human-scaled “sense of enclosure” that make humans feel comfortable. For humans, the preferred design is modest amounts of space. In particular, buildings need to be within walking distance of each other, and more compactly spaced and aligned to form desirable “outdoor rooms.” That means that great care must be taken when considering adding open space to a town center. 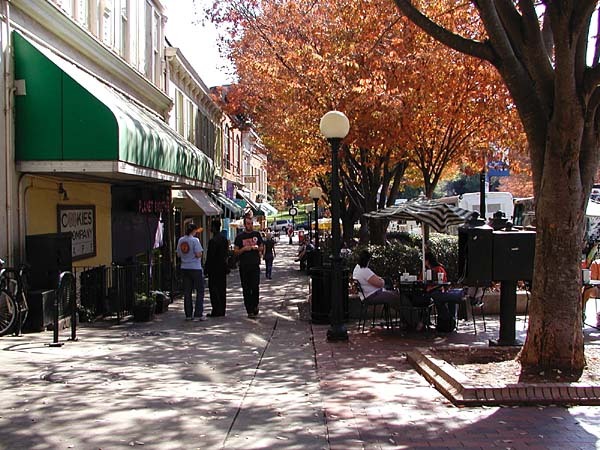 For a town center, elegant, formal, well-defined, modest spaces are called for. Squares and plazas, graced with formally-aligned landscaping (and landscaping that does not block views), is appropriate and desirable. Undefined, informal “open space” — at least in a town center — is not. In most cases, town centers need a reduction in open space — particularly when that reduction is in the form of shrinking the size of roads and parking lots. It is primarily our Fords that are telling us that town centers need more space. However unpopular it has become to say this, it is increasingly clear that traffic congestion in a city is our friend. It is not only effective in achieving a number of desired community objectives, but is one of the few tools we have available to us for making such objectives a reality. For example, congestion promotes urban infill, higher density urban development, use of transit, use of carpooling, community design for transportation choice, and retail health. Congestion reduces, on a regional basis, air pollution and gasoline consumption. It discourages and reverses suburban sprawl. It slows down average motor vehicle speeds. And it discourages multiple car ownership by households. For obvious reasons, suburban developers are fierce opponents of traffic congestion — particularly because it strongly undercuts their market for sprawl housing and sprawl commercial development. But again, a great many well-meaning community activists who want to “green” our cities also consider congestion to be substantial menace that must be fought against. Indeed, there is nearly a consensus in America that congestion is bad. The environmental activist literature regularly cites congestion as an evil that must be fought. Almost all of us have bought the extremely misleading (and regionall y false) argument that is invariably trotted out by the Road Lobby: Congestion aggravates air pollution and increases gasoline consumption. It is obvious! Common sense! Save the environment by widening roads! It is just a “coincidence” that the Road Lobby is able to benefit from the typical “solution” to congestion (often supported by those who seek to reduce air pollution and gas consumption). The all-too-common “solution” for congestion: Road widening. Increasingly, we are understanding that we cannot build our way out of congestion. Induced demand, whereby the widened road creates car trips that would have never occurred had we not widened, means that the widened road will create more per capita driving, larger levels of congestion, and more desire to flee to sprawl locations. What a widened road in a growing city delivers in four to five years: More air pollution, more gasoline consumption, more sprawl, more congestion and a downwardly spiraling quality of life. The keys, in sum, for a greener, more sustainable, and more lovable city are clear. Emphasize design for pedestrians, not cars. That means, somewhat counterintuitively, smaller sizes for streets and building setbacks, less greenspace, and slower speeds. Should We Toss Out Our Regulations for Better Community Design? Reduce the size of a community land development code. Make the code much easier to understand. Create highly visible, understandable and approved community and neighborhood visions. What we want, not what we DON’T want. Create more fairness by acknowledging that one size does not fit all. That there are a number of lifestyle preferences and that our land development codes should acknowledge and establish customized regulations for promoting. More quickly show what the rules are for development of a property. Reduce NIMBYism and increase trust and respect for local developers and local government. Madison Square Garden can seat 20,000 people for a concert. 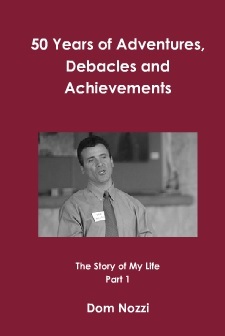 This blog was viewed about 61,000 times in 2010. If it were a concert at Madison Square Garden, it would have performed about 3 times. In 2010, there were 38 new posts, growing the total archive of this blog to 127 posts. There were 55 pictures uploaded, taking up a total of 4mb. That’s about 1 pictures per week. The busiest day of the year was January 19th with 492 views. 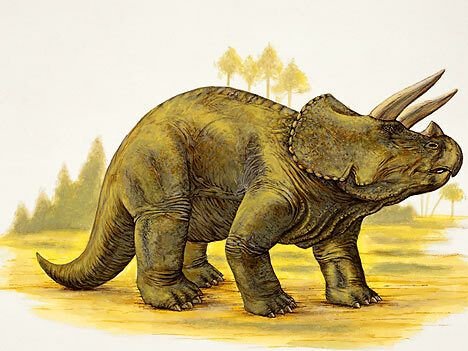 The most popular post that day was A Dinosaur Is Among Us. The top referring sites in 2010 were search.aol.com, facebook.com, walkablestreets.com, google.com, and ow.ly. Some visitors came searching, mostly for dinosaur, dinosaur pictures, dinosaurs, noise pollution, and dinosaurs pictures. We are living in a world that is safer than ever, yet we are paralyzed by fear and take extreme, counterproductive measures to be safer. We live, therefore, in an age of hysteria. Fear is very big business, indeed. A great many people in our society make quite a bit of money when they can induce fear, which helps explain why Americans are led to become so afraid of so many things so often. Who profits when a lot of people are worried? The media. The medical profession. The military. The police. Pharmaceutical companies. Firefighters. Car makers. Financial advisors. Environmental organizations. The home security industry. The prison industry. The vitamin industry. Even politicians, who have found that fear can effectively be leveraged to garner large numbers of votes. The list of things we, as a society, are scared to death of seems to grow each day. The media certainly has a vested interest in stoking the flames of fear, since the more terrorized we are, the more newspapers are sold and the more news programs are watched on TV. The list of irrationally frightful, deadly factors so many of us lose sleep over is seemingly endless. Killer shark epidemics keep us from beaches. Illegal drugs tempting our kids. Snow skiing without a helmet. Cholesterol or carbohydrates in our food. Terrorists – particularly those who might blow up a plane we are on. Genetically-modified or irradiated food. Our kids being kidnapped if they walk or bicycle to school. “Dirty” language or sexuality in our media. Cell phone radiation. And finally, a long-standing pet peeve of mine, the aggressive campaign to get bicyclists to wear helmets. How many other things do we do in our lives that are significantly more risky than the above? Things we don’t give a second thought to, yet are profoundly more risky. Driving a car. Eating too much and exercising too little. Drinking and driving. Smoking. Lax gun laws. Bicyclists who ride through red signal lights (who, BTW, I am often amused to see are wearing a helmet). In traffic accident statistics from the US and Europe, both pedestrians and car drivers in urban settings are consistently shown to be at higher risk than cyclists. The stock road bike is actually the safest as well as the most efficient way to get around a city. Deaths in bike accidents in the US average about 900 per year. 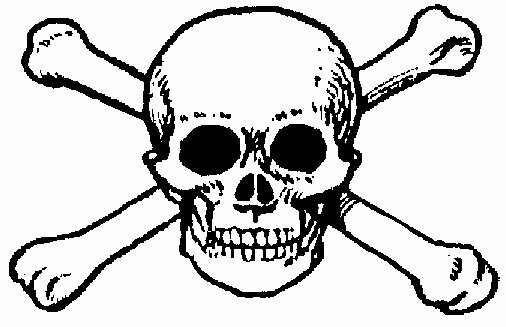 For a sense of risk scale: mortality from cigarette smoking is about 400,000 per year; from automobile accidents about 40,000 per year; from skin cancer about 10,000 per year. If we add the collateral damage from automobile driving (about 30,000 dead per year from smog-related diseases), cars kill something like 70 times more people than bikes. The British Medical Association maintains that the health benefits of cycling outweigh the risks by 20 to 1. The maximum risk to a cyclist is being struck by a car in traffic. But bike helmets are rated for forces equivalent to falling from bikes, not for the forces involved in being struck by a car at road speed. Most helmets are rated very honestly by their manufacturers as single-impact devices. On the first major impact, the helmet absorbs the shock; in doing so, the foam protective layer shatters. You are advised to replace it after any serious impact, for this reason. The bad news is that serious encounters with automobiles (the biggest danger for adult cyclists) often involve two impacts: one when the car hits you, and a second one as you are thrown, or fall, to the ground. Bike helmets are not engineered for two major impacts in a row, even though this is the type of collision (at speed) most likely to cause fatality or major injury. 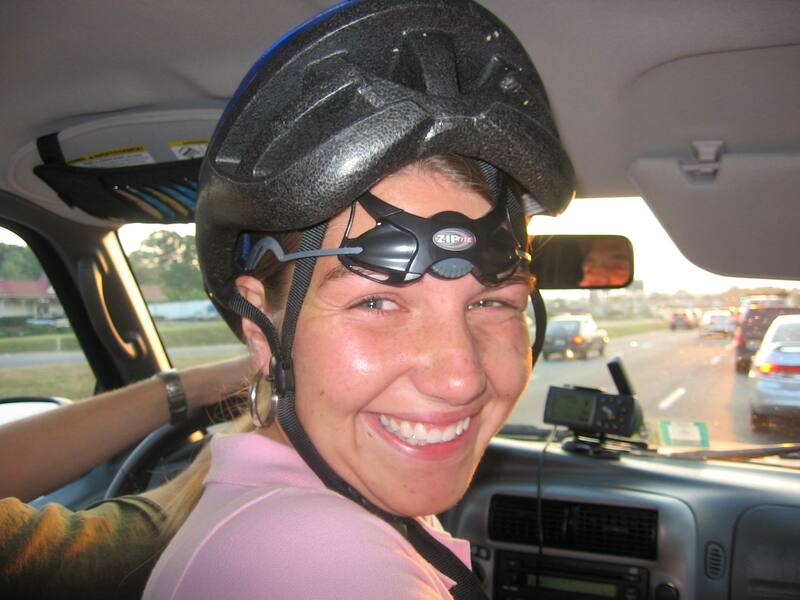 Despite the adoption of bike helmets due to trendiness and advertising in some areas, and the forcible marketing of helmets by state decree in others, there is no statistically meaningful connection between adult cyclist fatality and trauma rates and the wearing or not wearing of helmets. Great claims have been made for the reduction of juvenile cyclist traffic fatalities in the US since helmets became popular, but these proponents conveniently ignore the fact that juvenile pedestrian fatalities declined similarly over the same period: and in each case the simple explanation is that after the scare campaigns about traffic “safety,” many parents started forbidding their kids to walk or bike anywhere. Oddly enough, during the same years US health officials have been appalled by a new trend in reduced fitness among children. The primary effect of the unremitting campaign to “dangerize” cycling (besides increasing helmet sales and plastics industry revenues) is to make more and more people afraid to ride a bike, so that they choose to drive instead — exposing themselves to at least as much real danger. But there is also a feedback loop: their fear-driven preference for automotive transport then increases traffic congestion, thus raising the risk to pedestrians, other drivers, and cyclists. The fewer cyclists there are on the roads, the more dangerous it is for those who continue to ride. Children who are forcibly helmetized can develop a distaste for cycling and a longing to “grow up and get a car” so they don’t have to wear a helmet all the time. Teaching the next generation that bikes are dangerous and cars are safe (and cool) strikes me as a form of harm. Certainly, teaching children that a helmet is all they need to be safe does considerable harm, encouraging reckless riding and contempt for traffic law. And I mentioned above that kids who never walk or bike anywhere do not grow up as strong and fit as kids who have more individual, active mobility. Civic and regional agencies often feel that by enforcing helmet use they have done all that is necessary; they then feel free to neglect other, far more important bike safety issues and continue to prioritize and facilitate auto use. As one gentleman from Austin put it, they want to make it safer for cyclists to crash, not safer for cyclists to ride. As Wardlaw put it in his Dec 2000 paper in the British Medical Journal: “Cyclists don’t need helmets — they need priority.” Instead of getting priority (as a safe, non-polluting, congestion-easing, socially responsible form of daily transportation), cyclists are stigmatized as a bunch of daredevils indulging in a dangerous and impractical “sport”. The helmet hysteria that has been stirred up over the last quarter century has contributed greatly to this stigmatization and false characterization of cycling, and this in turn has caused harm by discouraging cycling and promoting the automobile. In the Netherlands and Denmark, commonly considered the most advanced and liberal countries in Europe, the solution to bicycle safety has been to tame traffic by restricting auto access to residential and shopping districts, reducing traffic speeds, strongly supporting public transit, and encouraging and subsidizing bike riding. In the Netherlands, bike helmets are not only not mandated, but US cyclists who visit there and ride helmeted cause considerable public amusement. In the Netherlands, from 40 to 50 percent of the population commutes to work on bicycles. The notion that Americans think cycling is dangerous is quite funny to Dutch cyclists, who are well aware of America’s pathetic record on gun control! Despite all this “dangerous” unhelmeted riding, the bike safety record of the Netherlands is exemplary, with the lowest mortality rate of any industrialized bike-riding nation. This is because they have addressed the real problem: the cars. Forcing helmets on cyclists is not a progressive move, but a reactionary move that perpetuates the special privileges accorded to the automobile industry and to automobile users. “Dangerizing” bikes distracts public attention from the many dangers of automobile travel. This privileging of the automobile is maintained at tremendous environmental and social cost. There are three groups of people who really benefit from bike helmet laws and the helmet scare campaigns. The auto industry sells more cars to people who are afraid of cycling, and the oil companies sell more petrol. The auto/oil lobby wins. The insurance industry gets to deny more compensation claims: in a helmet-crazed society, any cyclist who has the bad luck to be struck by a careless driver while not helmeted can pretty much count on being blamed for his/her own injuries by police, media, and courts … even if the driver was in violation of the vehicle code at the time of the accident. So the insurance company wins. And of course, the plastics industry and the helmet manufacturers win — they get to sell millions of units to a captive market, in countries with MHLs, and to a scared, insecure consumer base even in countries without MHLs. There’s nothing progressive about an aggressive marketing campaign that plays on public fear, spreads disinformation, perpetuates car-dependency, promotes injustice, and lines the already plush pockets of the petroplastic, insurance, and auto industries. One of the leading health problems in the US (second to tobacco addiction) is poor cardiovascular fitness. One of the root causes of poor fitness is a life with no regular exercise, largely created or even enforced by total automobile dependence. Daily bike riding has been estimated to add as much as 10 years to a person’s life span. Contrary to the anti-bicycle propaganda produced by the helmet law faction, riding a bicycle has a lifetime health impact that is far more positive than negative. A far-seeing public health policy would encourage Americans to ride their bikes every day, and would start to work on dismantling our automotive prison society in which people are literally coerced into owning and driving cars. When all-ages helmet laws were enforced in Western Australia, bike ridership declined considerably and has not yet recovered. If we consider that daily cycling may add years to an individual’s life, then we should conclude that this discouragement of cycling constitutes a negative public health policy. The cyclist who is likely to resist helmetization is much like the ordinary pedestrian who sees no need to wear a full hockey goalkeeper outfit just to walk to the corner store. People who ride at moderate speeds, on even, paved surfaces — not for thrills but for daily utility like grocery shopping and commuting to work — are not at high risk and consider biking a simple, low-impact, normal way to get about. Just like our cyclist friends in the Netherlands, except that in the US the quotidian cyclist is a tiny minority. Cycle helmets provide best protection in situations involving simple, low-speed falls with no other party involved. The average person doesn’t put on special shoes, clothes, or a special attitude to walk to the corner store, and they tend, reasonably enough, to resist having such ordinary activities redefined as abnormal and requiring specialized sporting gear. The helmet manufacturers and marketers seem now to be dazzled by the prospect of unlimited sales opportunities if they enlist national and local governments to force the citizenry to buy helmets for any ordinary use of a bicycle. It’s a pity that so many governments, and so many ordinary people, are buying the hard sell. The net effect is to convince people that cycling is hazardous, encourage them back into their cars, and make the streets more dangerous for the remaining riders. It really is a big deal. Mandatory helmetizing has discouraged cycling, and this at a time in human history when we desperately need to encourage cycling and reduce the use of automobiles. We need a little less attention to common sense; a little less wishful thinking and superstition; and a little more attention to actuarial statistics. The Danish, world famous for the enormous levels of bicycling, recently engaged in the hysterical measure of aggressively pushing bike helmets in that nation. One result? Bicycling has DROPPED significantly in that country. That is no coincidence, in my opinion and that of the speaker in the video link below. It is common for strong bike helmet advocates to conjure up emotionally-charged images such as your “head will be crushed like an egg – it is simple laws of physics,” when arguing that all bicyclists should wear helmets. Of course, these images perpetuate the common mis-perception that bicycling is extremely dangerous and only reckless, crazed people (and “macho men”) would consider it. The crushed egg metaphor induces hysteria and a call for action to do ANYTHING to increase safety. As I write this in November 2010, we can see how most Americans have become so hysterically terrorized by the thought of terrorists blowing up planes that they willingly accept quite invasive searches they would never otherwise submit to. Ironically, no one notices the slow-motion deaths of people over the course of several years. The deaths of people who are sitting behind the wheel of a car and dying from the resulting inactivity and resulting obesity. People who are driving because it is “safer.” People who don’t realize that driving instead of bicycling is significantly more likely to result in premature death. People who don’t ever wear a helmet while driving a car, even though head injuries are more likely while in a car than on a bike (on a per-trip basis). No one gets terrified of dangers, in other words, when an overweight person dies of diabetes in a hospital bed after living a life driving a car. The image is much less compelling – much less likely to suggest danger and evoke a call for safety measures – than an image on the TV news showing a bicyclist killed by a car. How often do Americans talk about the dead guy lying on the pavement and his head crushed like an egg WHO WAS DRIVING A CAR? It is not just the Danes who bicycled less when hysterical efforts to get bicyclists to wear helmets was started there. A number of people in nations such as America – myself included – would bicycle less (or not at all) if helmets were required by law. Would I be more healthy or live longer if I drove more and bicycled less? Clearly not. How many Americans (and others) don’t bicycle because bicycle helmet campaigns create an exaggerated impression that bicycling is dangerous? Apparently, quite a few, given what happened with the bicycle-friendly Danes. The video below is especially important for those who cannot understand why I don’t wear a helmet while bicycle commuting. Who think I’m being reckless and risking my life. People who need to look at the data (and maybe try riding a bike on a regular basis) before making “common sense,” patronizing comments to me about how I am being stupid for not wearing a helmet. I agree with the speaker: Why are MOTORISTS not wearing a helmet?? As an aside to all of this, I want to be clear about something: I am NOT suggesting that people not wear helmets. If a person feels more comfortable wearing one, by all means please wear one. What I AM suggesting is that campaigns to aggressively urge all bicyclists to wear a helmet – particularly mandatory helmet laws – are counterproductive when it comes to safety, public health and encouraging more people to ride bicycles. 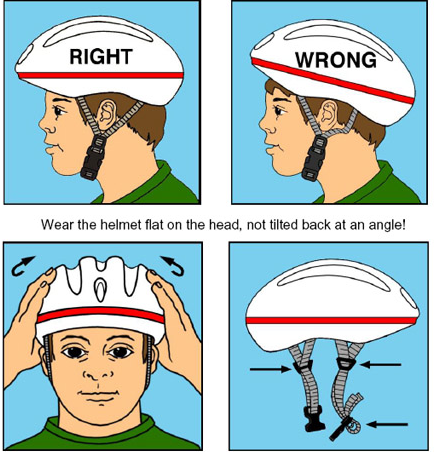 As I have noted in my blog link below, aggressive or required helmet campaigns “dangerize” or inconvenience bicycling. It is clear to me that to the extent that dangerizing (sending non-bicyclists the message that bicycling is very dangerous) discourages some (perhaps large numbers) from bicycling. To the extent that bicycling is discouraged, public health declines as more citizens are sitting behind the wheel of a car more often (and are more at risk by driving a car). In addition, I am firmly convinced that the most effective way to improve bicyclist safety is through safety in numbers. Because helmets discourage bicycling, bicycle safety for myself and other bicyclists declines. What can be worse, in this time of troubled economics, environmental and public health, and energy scarcity, than discouraging bicycling? This is a must-see video about promoting bicycling, particularly for those who support the use of bike helmets.